Acetate salt or HCl salt peptide synthesis: TFA Removal Service. 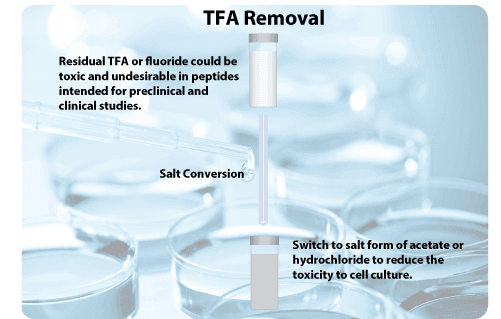 TFA removal service: switch to acetate or HCl salt form of peptide. Trifluoroacetic acid (TFA) is commonly used to release synthesized peptides from solid-phase resins. TFA or acetate is also used during the reversed-phase HPLC purification of peptides. The acids at low concentration are helpful for peptide solubility and HPLC separation. However the residual TFA or fluoride is toxic and undesirable in peptides intended for preclinical and clinical studies. Free TFA can generally be removed after lyophilization for an extended time. But the TFA salts with the peptide or with other buffer ions are difficult to completely remove. Peptides are usually delivered as TFA salts. If residual TFA would be problematic for your experiment, we recommend other salt forms such as acetate or hydrochloride. However, these salt forms are usually 20–30% more expensive than regular TFA salt forms because of the peptide loss that occurs during the salt conversion and the increased amount of raw materials required. TFA can be very problematic; therefore, we can either remove the TFA salts or avoid them altogether. TFA and HCl are both strong acids that will protonate any amino group. They can be removed by performing anion exchange on the same reversed phase HPLC on which the peptide was purified. LifeTein uses a special reverse phase C-18 material that provides good separation without TFA. The peptide is loaded on the column, washed with sufficient acetic acid buffer, and then eluted it using an aqueous acetic acid/acetonitrile gradient. After freeze drying, the counterion TFA will be exchanged. The technique relies on the hydrophobicity of the peptide, and a very hydrophilic peptide will require a proper anion exchange resin. The most adapted method is to replace TFA counterions by an stronger acid such as hydrochloric acid (HCl). How to remove TFA from synthetic peptides using HCl? Dissolve the peptide in distilled water at 1 mg (weight) per 1 mL of solvent. Phosphate buffer (50mM phosphate and 100mM NaCl) can be used instead of water. Add 100 mM HCl to the peptide solution for a final HCl concentration between 2 mM and 10 mM. HCl concentration below 2 mM or higher than 10 mM may result in incomplete TFA exchange or modified peptides. Allow the solution to stand at room temperature for at least a minute. Freeze the solution at -20, -80, or preferably in liquid nitrogen. Lyophilize overnight to remove all liquid. Re-dissolve the lyophilized powder in HCl solution. Freeze the solution again and then lyophilize overnight. Repeat steps 6 to 7 at least two times. After final lyophilization step re-dissolve the peptide in water or your desired buffer at around 2 mg (weight) per 1 mL of solvent.